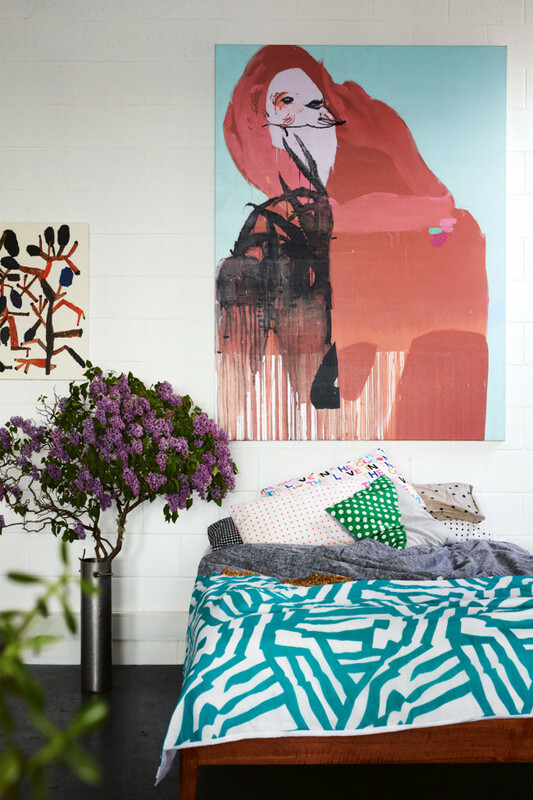 Today, we are visiting the two-story warehouse-style home of Melbourne-based artist, Kirra Jamison. The house is reflecting the colorful, warm, simple and easy-going Australian style. 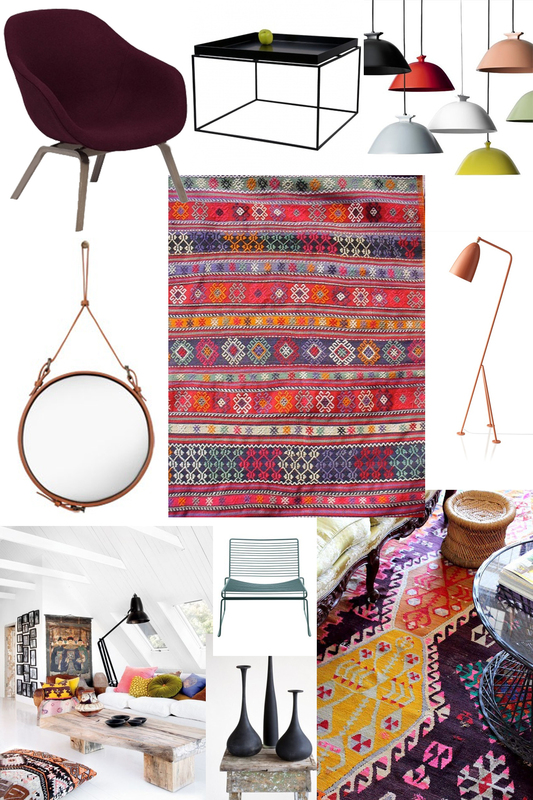 In this exciting creative home; furniture and art come together with most stylish taste. 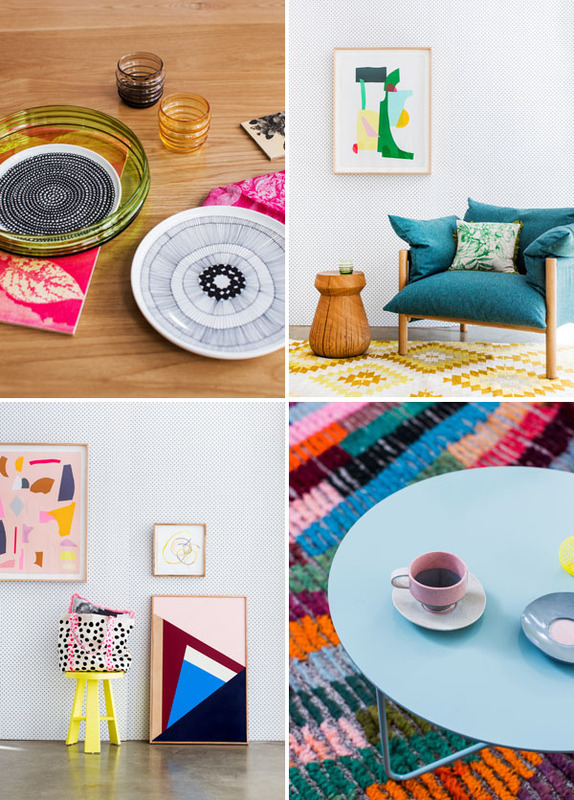 In a way, I could say the interior decor of the home is an extension of Kirra Jamison‘ s artwork with its bold, fresh colors and geometrical forms and with old used elements. The house is also full of surprising details such as swing in the dining area which adds a playful touch to open living area. 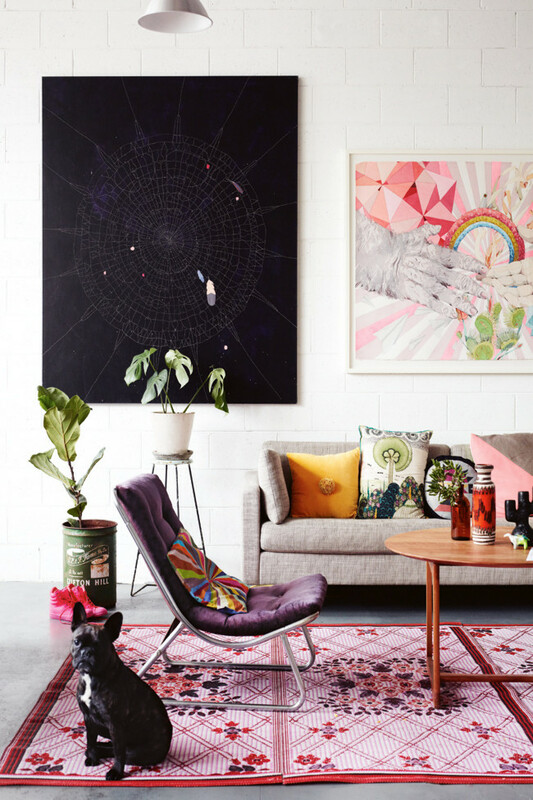 The open living style of Kirra Jamison‘ s house is truly welcoming, eclectic and cheerful. The sweet little french dogy looks awesome on the great carpet where he stands and poses.. 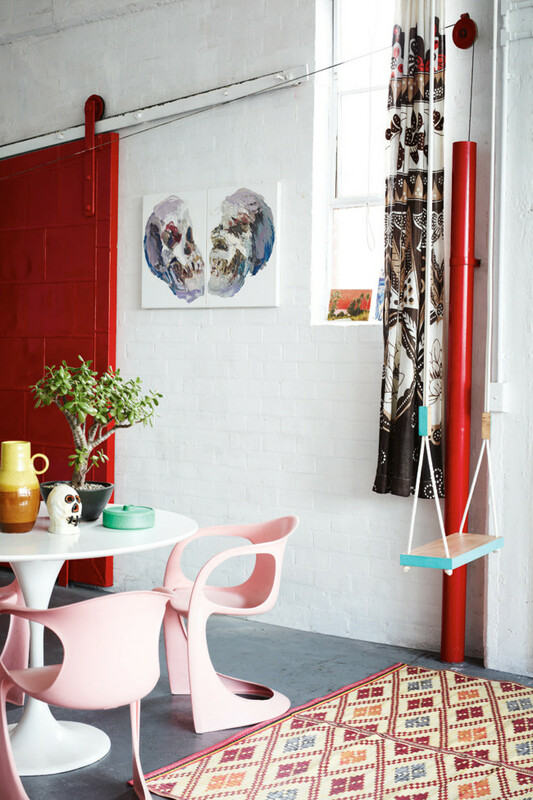 The red barn door, the pink retro modern style dining chairs, Ben Quilty’s skulls paintings hang on the wall, the beautiful rug on the floor they all get together in an unexpected way, confirm an artistic and bold style as the owner of the house. Every little corner of the home shows Jamison’ s and other artists artwork on the walls . The carpets and the decoration details in great color & form combination coordinates beautifully with the rest of the design details around the house. 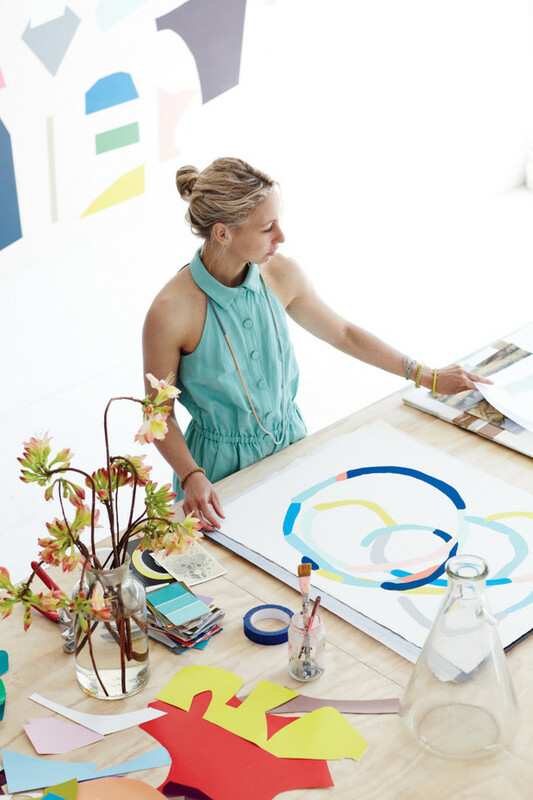 Kirra has a studio space in downstairs which is full of daylight. 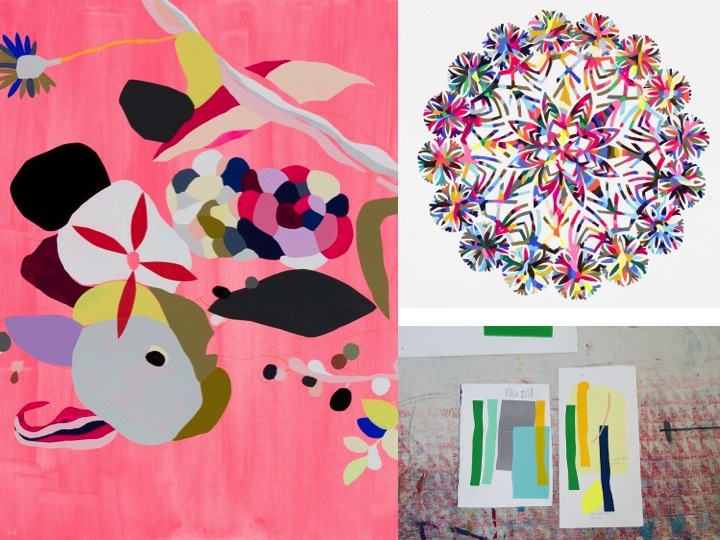 She explores the colors and creates her own fresh work. The space she leaves in surely inspirational and a great background for her work. The graphic motifs throughout the home is dominant. 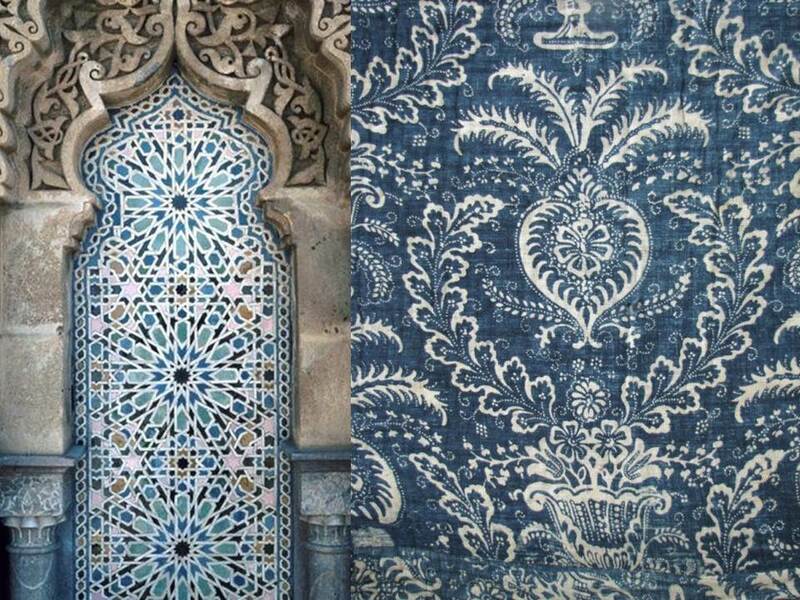 It is possible to see these forms and colors on most of the textiles and fabrics that she uses in decoration. The bedcover, polka dot pillows on her bedroom area is confirming this look. Its really nice to see your blog.. You are really a awesome designer.. keep rocking.